Lock in a great price for Hotel Giulietta e Romeo ***S – rated 9 by recent guests! The hotel is located 1 min walking to the Arena or the main shopping area. The staff were very friendly and helped us with printing tickets and providing space for conference call. The room was cozy but sufficient. It was fairly quiet, no noise from the street. Great location. Great facility. Clean! Excellent stuff. It’s at Verona the best location. Comfortable, clean, good breakfast. This apartment just a few steps away from the main hotel is in an amazing location near all the sites. The staff is friendly and helpful. The rooms are basic but nice. My wife and I stayed here once before and liked it, but now with all the updates it's even better. I was very impressed with both the hotel and your staff. Will definitely be staying here again. The staff was very gracious and helpful!! The room was clean and cozy and we had a wonderful time in Verona! The bed were very comfortable. The room was immaculate. Bathroom was large, modern and clean. The staff was friendly and helpful. We were just steps away from the arena. Love the location!!! Very helpful stuff! Amazing breakfast! Easy check-in and check-out accommodations! Location, location, location!!! Hotel Giulietta e Romeo ***S This rating is a reflection of how the property compares to the industry standard when it comes to price, facilities and services available. It's based on a self-evaluation by the property. Use this rating to help choose your stay! 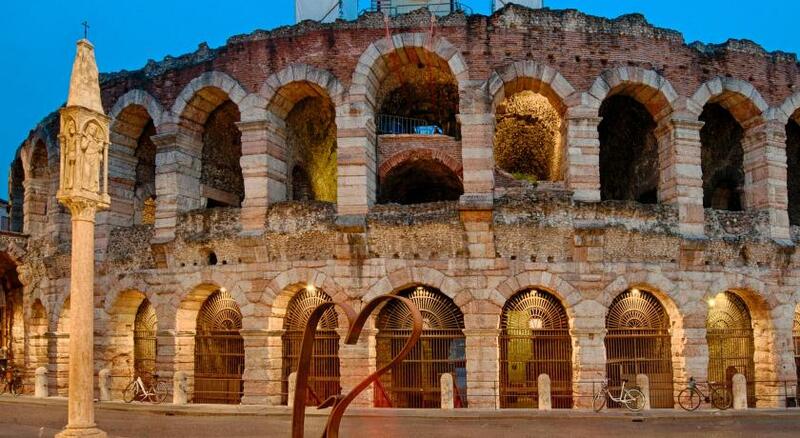 Offering free high-speed Wi-Fi, Hotel Giulietta e Romeo is just 150 feet from the Arena Verona and 650 feet from Piazza Brà square. Rooms come with elegant parquet floors, a mini-bar, and a satellite LCD TV. Rooms are air-conditioned in summer. Each one has a private bathroom with shower and hairdryer, and a bidet in most units. 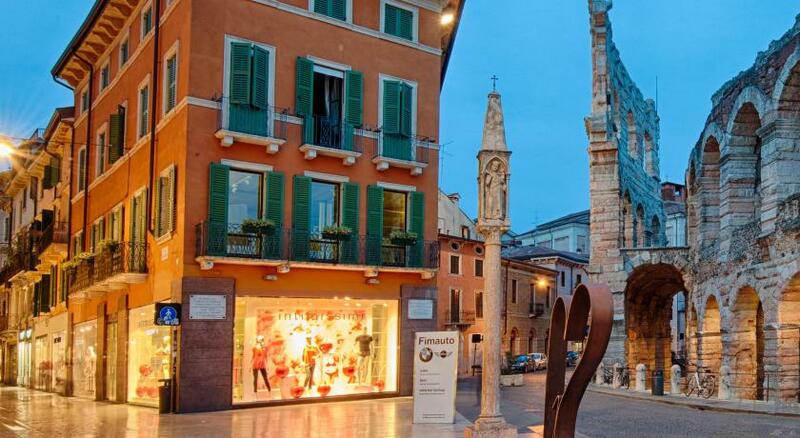 Verona Train Station is 1.5 from km from Giulietta e Romeo Hotel. You can reach the hotel by car, and use the private garage, available at extra charge. Città Antica is a great choice for travelers interested in food, ambiance and atmosphere. 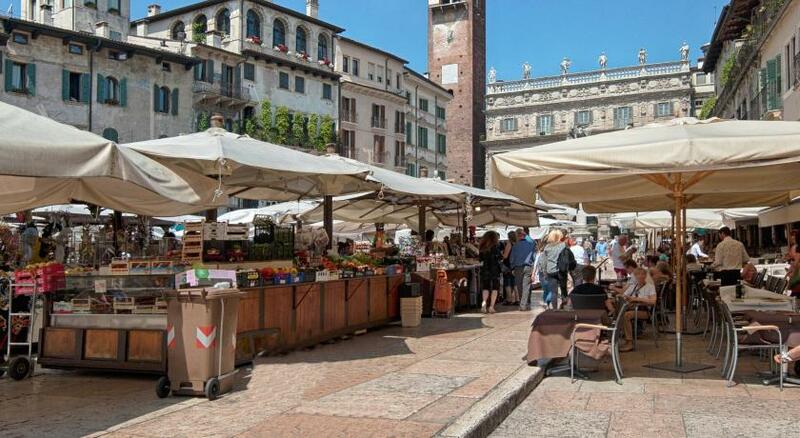 This is our guests' favorite part of Verona, according to independent reviews. This property also has one of the top-rated locations in Verona! Guests are happier about it compared to other properties in the area. When would you like to stay at Hotel Giulietta e Romeo ***S? Room with attached bathroom with parquet floors. Offers free Wi-Fi, air conditioning, and a flat-screen TV with satellite channels. Private parking is available on site (reservation is needed) and costs EUR 29 per day. This private room has parquet floors. It has free Wi-Fi, air conditioning, and a flat-screen TV with satellite channels. This suite features a balcony, bathrobe and mini-bar. Two connecting rooms with air conditioning, satellite TV and a bathroom. Free WiFi is available. This air-conditioned suite has satellite TV and a private bathroom. This unit is located 98 feet from the main building. Featuring a balcony and free WiFi, this larger twin/double room has a satellite flat-screen TV and air conditioning. Air-conditioned room with a French bed and flat-screen TV. This suite has a private entrance, air conditioning and satellite TV. Located next to the main building, this suite has air conditioning, flat-screen TV and sofa. Located next to the main building, this suite features a balcony, soundproofing and air conditioning. Hotel surroundings – This neighborhood is a great choice for travelers interested in food, ambiance and atmosphere – Check location Excellent location – show map Guests loved walking around the neighborhood! 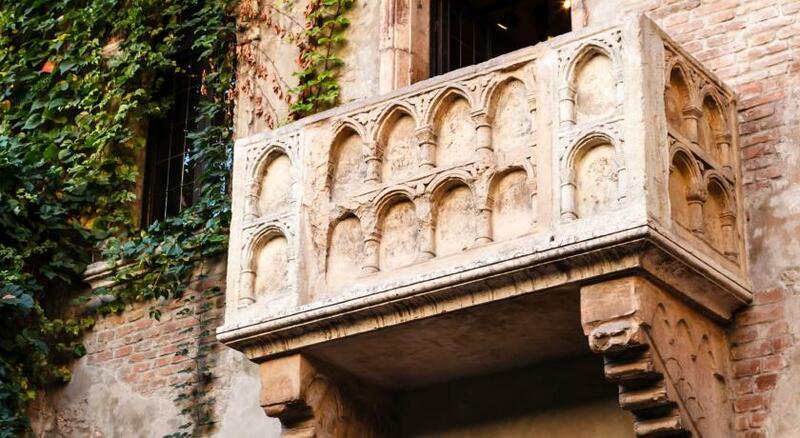 Find a place in the charming center of Verona – the setting of Shakespeare’s Romeo and Juliet. House Rules Hotel Giulietta e Romeo ***S takes special requests – add in the next step! ATM card Hotel Giulietta e Romeo ***S accepts these cards and reserves the right to temporarily hold an amount prior to arrival. Hotel Giulietta e Romeo ***S accepts these cards and reserves the right to temporarily hold an amount prior to arrival. Parking can be accessed between 08:00 and 20:00. On the check-out day is only available until 16:00. Please note, the property is in a Restricted Traffic Area. It is reachable by car, as the hotel takes care of the permits. When using a GPS device, please set it on Via Malenza, then follow signs. 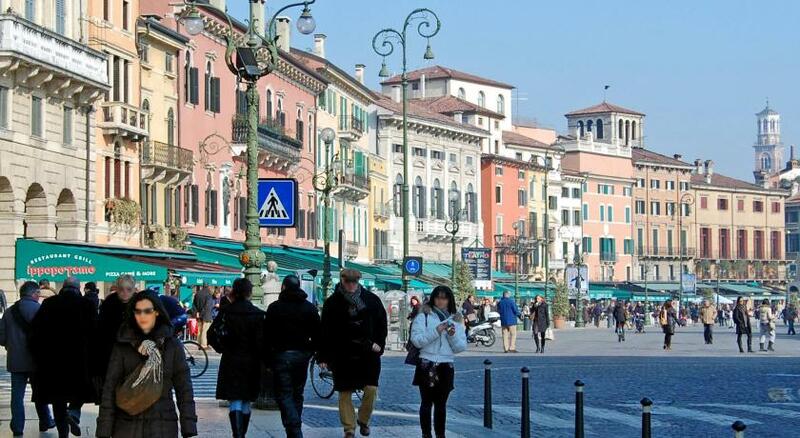 One of the most picturesque neighborhoods in Verona! Super expensive for the size of room. Our friends had an apartment on same street that was 2x the size of our room for half the price. The room given to us was too small for two people. They should sell the room for one person only. The reception staff were very helpful. The staff should not be sweeping the floor and moving tables and chairs whilst we are having breakfast. We have reported this to the hotel. The location was excellent - quiet but within a few minutes of restaurants, shops and sights. Our bathroom was large and well appointed. Walls are extremely thin, could hear the man in the room next to me snoring all night and screaming children in the morning. Amazing location, close to everything and staff is very friendly. Great location, staff were really friendly, they provided gluten free breakfast stuff for us and it was a lovely hotel. The room we were given was too small for two people. The room given to us should be sold as single room only. Not good value for money. The staff were incredibly helpful and the location of this hotel is excellent for exploring the city. Great location! And the staff were so helpful. More light needed for the writing desk in our room; and a power point at the desk would be useful. The hotel is elegant, comfortable and very well situated. The staff were very friendly and helpful.